Silky have developed a brand new and innovative take on an item that's been stuck in the same place for many years, opaque knee highs. You might think such a basic and simple item is easy to make, but it's often the essentials that need so much more attention to detail. These basic, everyday items have been redesigned to fit perfectly and have been made with the very best and most stretchy fabrics, meaning it retains its fit and quality for many, many wears. 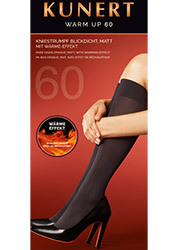 Rating: 5 Very pleased with these, lovely warm feel, and comfortable fit to the knee. Rating: 5 Very good quality product, I am male and consider these a good buy as I prefer to wear long socks and these fit the bill very well, the price is far better than the long socks I used to buy , and they do wear well,end of story, I definately consider these to be unisex.